There’s no word at the quality of the streamed content, but we guess it will be DVD quality, not high-def. 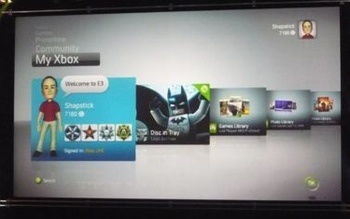 The service launches in the fall with the Xbox’s new dashboard. 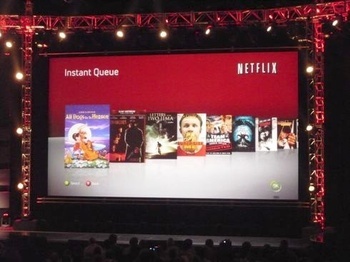 Limelight Networks is providing the Content Delivery Network for the new Xbox-Netflix partnership. Reed Hastings, Netflix CEO, told Bloomberg, “We’re definately building up a big head of steam. 2008 and 2009 are strategic investment years. By 2010 we’ll be able to maximize revenue and profits. “Our key competitive strength is our ability to combine [downloads with Netflix’s DVD-by-mail service],” he said. Speaking of the dashboard, Microsoft announced at the E3 Media and Business conference that the Xbox 360 will be getting a total overhaul this fall. New features will include fancy Mii-like 3D avatars popular on the Nintendo Wii game console and an improved emphasis on community with IM, video chat, and photo sharing. Gamers will be able to chat with up to eight friends simultaneously and form LIVE parties. The avatars will be integrated into Web sites and upcoming games such as Uno Rush, which is a nice touch. One of the best-loved features of the Wii are the Mii avatars, so when you are playing a game you actually see some representative of a family member or friend, rather than your sister choosing the punk-rock-chick avatar that means nothing except that sis might like The Clash. “When people turn on their Xboxs this fall they’ll get an entirely new interface and dashboard, an entirely new Xbox through the magic of software,” said John Schappert, head of LIVE services. Taking cues from Nintendo and Sony, who is working on the Home aspect of the PS3, isn’t a bad idea for Microsoft and the Xbox.